hello! moisturising after a shower is something i always do, no matter what. my routine just doesn’t feel complete without spraying something on, especially after using a body scrub. so, for ultra soft and silky skin, i keep turning more towards body oils as they aren’t as heavy as a body cream or body butter, which is perfect for this humid weather we’re having. dry oil sprays are my favourite, as they hydrate but dry oh so quickly so you don’t get that horrible sticky feeling when you’re trying to get dressed. 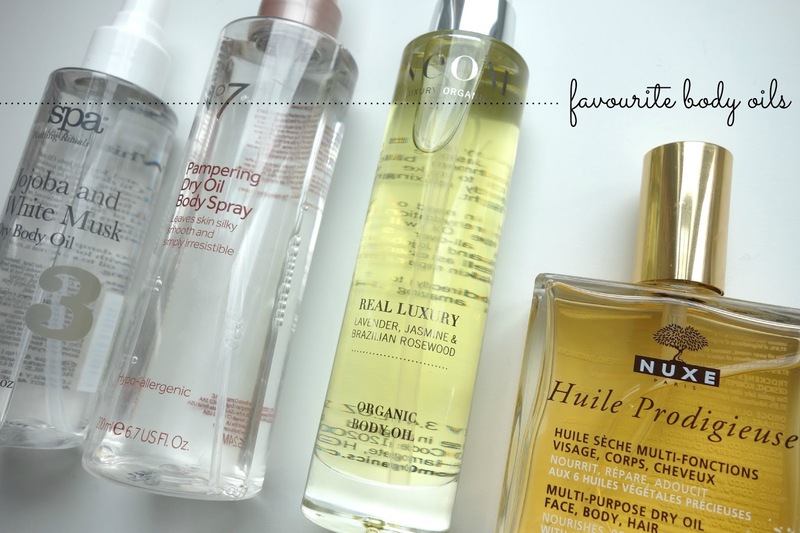 no.7 pampering dry oil body spray is the one i’ve been using the longest and always repurchase. it has the most lovely warm scent which stays on the skin and leaves it feeling amazing. 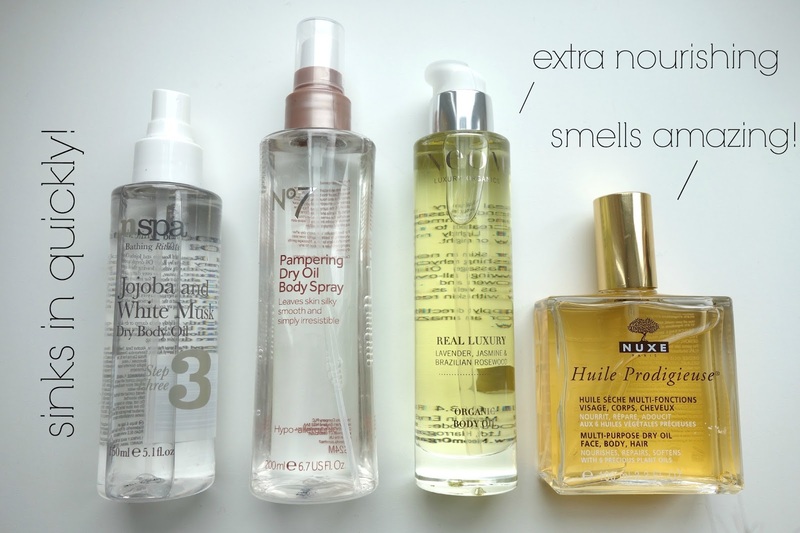 another favourite is NSPA jojoba and white musk dry body oil*, as it’s such a good price and available in asda so you can totally pick it up with your shopping. any excuse, eh. if you’ve got a few more pennies to spend, then opting for nuxe huile prodigieuse multi-purpose dry oil is always a great choice. it has a lovely scent (sort of floral-ish, it’s rather hard to describe) and, as the name suggests, is genuinely multi-purpose. i spray a bit into the ends of my hair as well and it makes it so smooth. finally, if my skin wants a bit more hydration, i’ll pick a slightly heavier oil in the form of neom lavender, jasmine and brazilian rosewood body oil*. even though i’m not a fan of both lavender and rose, i adore the scent of this as it’s not overpowering or too floral. it feels so luxurious on the skin, only takes a few more minutes to sink in than the others and i adore using it as a treat once a week. so, that’s all of the body oils that i adore using on a regular basis. sometimes i’ll switch it up with a body butter, gel or cream depending on what my skin needs, but typically more when it starts to get cold! i might do a post about them when autumn kicks in a little bit. do you use body oils? what do you use as a body moisturiser? let me know! ps. check out all of these amazing blogs: pretty little us, fxshion, right up my street and the student wardrobe!